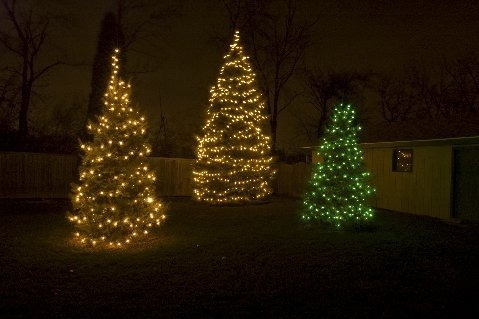 Here we used mini lights to wrap the trunks of these trees for a stunning effect. What comes to mind when you think of Christmas magic? Is it the scent of gingerbread mingled with the subtle aroma of a freshly cut Christmas tree? Maybe it is an avalanche of brightly colored gifts adorned with ribbons and bows? No matter what causes you to relish in the holiday season, the beauty of holiday decorating is high on everyone’s list as a way to create magic during this time of year. 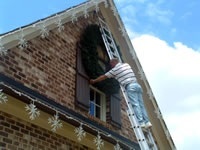 An important part of holiday decorating includes the exterior of your home. The outside of your home is the part that neighbors and onlookers see and no matter how beautiful the interior of your home is during the holidays having a lifeless, dark landscape can make you appear to be the Scrooge of the neighborhood. The outside of your home also welcomes friends and family to your door during the holidays. Outdoor Christmas lighting is the most effective and dramatic way to make a statement and add the spirit of the holidays to your home’s exterior. Lighted LED starbursts add whimsy and fun to the holiday landscape when hung from the branches of trees. 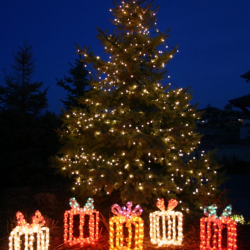 There are many genres of outdoor holiday lighting. Roofline lighting and adding lighted touches to your homes facade and architecture are great mediums to use in any holiday lighting display, but the most dramatic lighting effects can be seen through the techniques used in holiday tree lighting. Lighting trees and shrubbery within the landscape is enchanting. There is more to tree lighting than just assembling a string of lights to a tree and turning them on. Holiday tree lighting is an art. 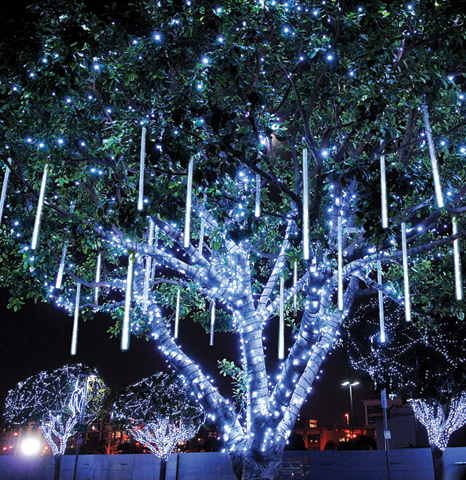 Choosing the right tree to light, and using the right holiday lighting elements to light it can make or break the effect of your lighting design. Here are a just a handful of the holiday tree lighting techniques we use to create holiday magic in the landscape of homeowners here in San Antonio. Our newest introduction this season is snowfall lighting. This unique play on holiday tree lighting emulates the look of falling snow through a special lighting technique. This tree lighting technique is called tree wrapping. By wrapping lights around the trunk of the tree it creates a hauntingly beautiful effect. This is especially effective when used to line tree lines of driveways and along the edges of your landscape. Adding lights to evergreens within your landscape gives your holiday lighting display a classic, traditional Christmas feel. This genre of lighting proves that the most beautiful tree of the season may be as close as outside your front door. Holiday tree wrapping also works great in commercial holiday lighting displays by adding a charming beauty and elegance to any location. Even if you don’t have a tree, Outdoor Lighting Perspectives of San Antonio can create one with our lighting artistry and techniques. This unique residence has a pond located on the property and we created a tree of lights as the island of the pond, truly breathtaking. Any one of these enchanted outdoor tree lighting techniques can help you achieve the holiday lighting display that you have always dreamed of. We can customize your display to include one, or many of these festive elements. Contact Outdoor Lighting Perspectives of San Antonio and The Hill Country today to learn more, time is of the essence to ensure your display is up and running in time for the big day! See more inspiring holiday lighting images by visiting our holiday lighting gallery located on our website. 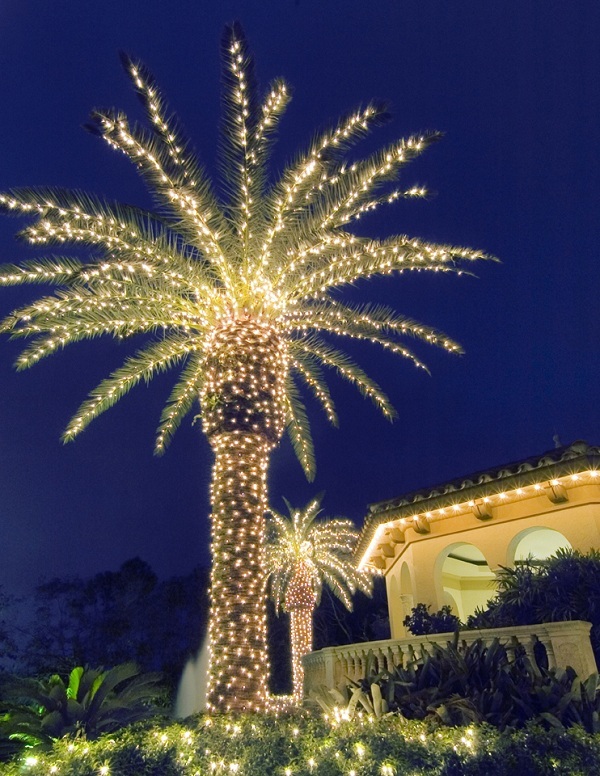 This lighted palm tree becomes the focal point of this San Antonio landscape during the holidays. I was riding in the car the other day listening to the radio when a commercial came on that spoke of the day after Halloween as the beginning of the holiday season. I pondered on this statement for a moment, and came to the conclusion that for many of us our Christmas season does indeed begin the day after Halloween. Any retail establishment you visit the day after O’ Hallows Eve is stocked with holiday themed items and decorations. You have to wonder if a team of Santa’s elves were busy throughout Halloween night taking down the witches and pumpkins and replacing them with items trimmed in red, gold and green. These quick changes have become so commonplace that consumers are now accustomed to the quick shifts from one holiday to the next. In years past the holiday season began the day after Thanksgiving, but in our world of “out with the old and in with the new” things have changed quite a bit. The point I am making is that the Christmas holidays are now upon us and now is a good time to start thinking about holiday decorating and all the things that make the holidays sparkle and shine. 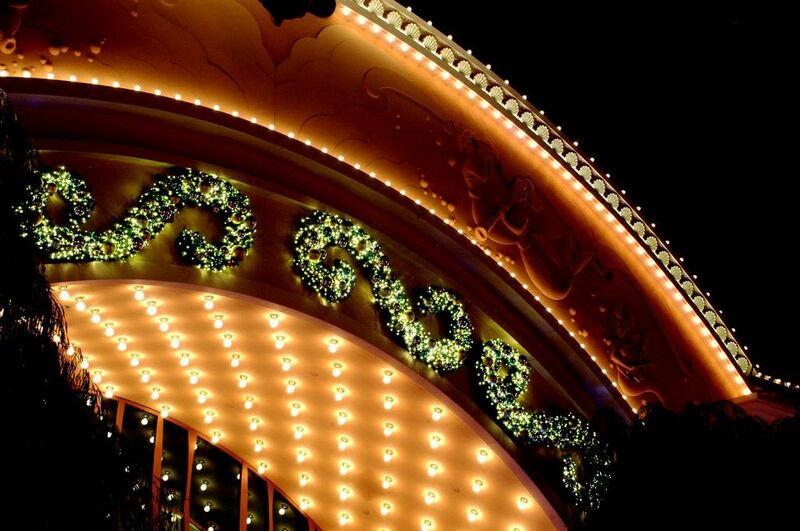 Our classic C9 holiday lights take you back to the magic of your childhood. One of the most important elements of holiday decorating is holiday lighting. We use holiday lighting to trim the traditional family tree and wind white lights and garland around the mantels and staircases in our homes. Imagine having your home fully decorated for the season and you look out into your yard one evening and it is lifeless and dark. 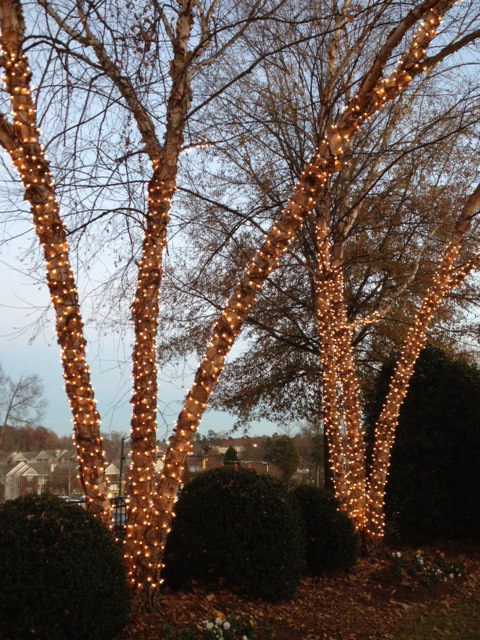 Outdoor holiday lighting is a great continuation of the festive decor you use indoors to signify the holiday. Outdoor holiday lighting will also make your landscape glow and delight not only your family and friends, but will put a smile on the face of each person that passes your home. If you are looking for a way to make your entire holiday display unified outdoor holiday lighting is the glue that holds the holidays together. Outdoor Lighting Perspectives of San Antonio can make sure your holiday lighting is right on time with your indoor holiday decorating. We not only have the area’s biggest selection of high-quality outdoor holiday lighting fixtures and elements, we also offer an innovative program that gives you convenience and value. Our outdoor holiday lighting program involves assistance designing your lights, ordering your lights, installation, removal and storing your lighting display in our temperature controlled warehouses. This means while you are busy making your interior festive, we can handle the outdoor holiday magic. 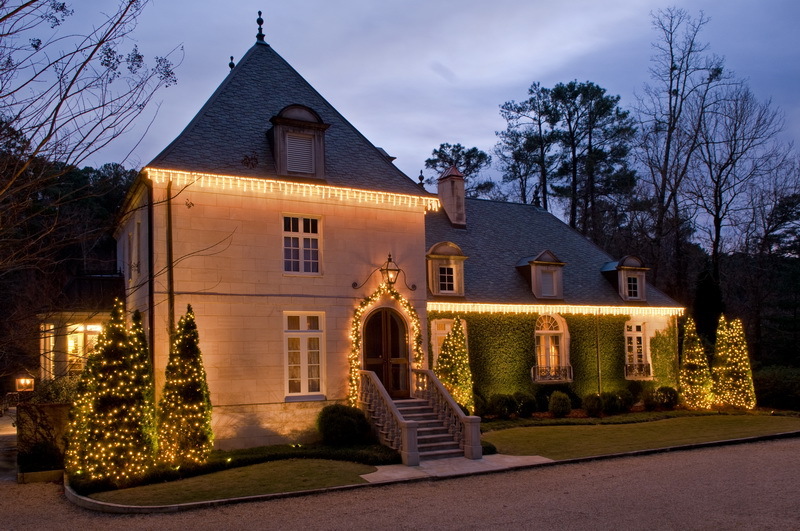 One great aspect of using outdoor holiday lighting is the choices available to create a theme that will suit your taste and complements your home and landscape. Traditional holiday lighting such as the super-efficient C9 lighting are reminiscent of a by-gone era. These are the lights that take us back to our childhoods in white, red and green. Using C9’s can deliver elegance through simplicity. We also specialize in lighted LED wreaths and garland for your outdoor display. Using lighted garland and wreaths can add that finishing touch to any outdoor display and helps integrate the cozy feel of the season. If your tastes lean more toward an elaborate display, we can quench that thirst as well. We offer holiday lighting that is unique and dramatic. Our newest tree lighting technique is called snow fall lighting which emulates the look of falling snow by using lighting. We also offer a whimsical selection of 3-dimensional lighted yard displays that can tell your favorite holiday story through lights. Roofline lighting has also become a hot commodity in outdoor holiday lighting and our selection of roofline lights ranges from traditional to themed roofline lights in a wide variety of shapes and colors with candy canes and snowflakes galore. 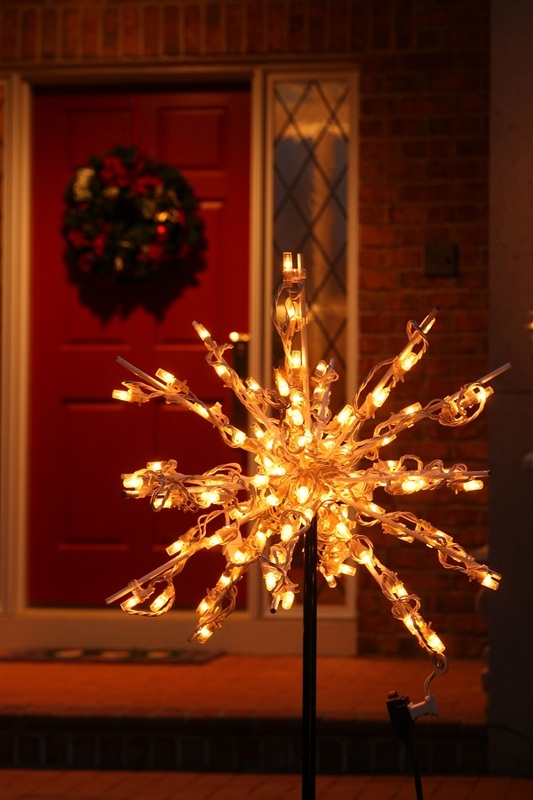 These lighted starbursts will add whimsy every step that leads to your front door this holiday season. The holidays are definitely a time of preparedness, from planning the perfect Christmas dinner menu for your family and friends to scheduling your consultation with us to take care of your holiday lighting. Now is the time to contact us to get the ball rolling and make this the most memorable holiday season ever. See more breathtaking images of our holiday lighting designs by visiting our holiday lighting photo gallery, located on our website. The holidays are almost here and it is time to think about Christmas lights again. The smell of gingerbread and cinnamon is in the air. All around us are the sights, and smells of Christmas. Now is the time to start thinking about your holiday decorating. As with any cohesive interior and exterior design, professional lighting is the glue that holds everything together. 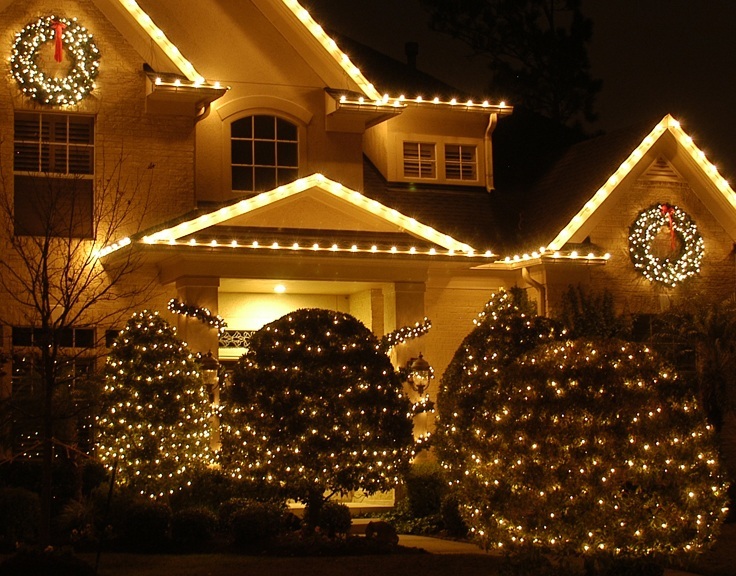 With Christmas decorating, your holiday lighting can turn a nice holiday display into an amazing holiday display. 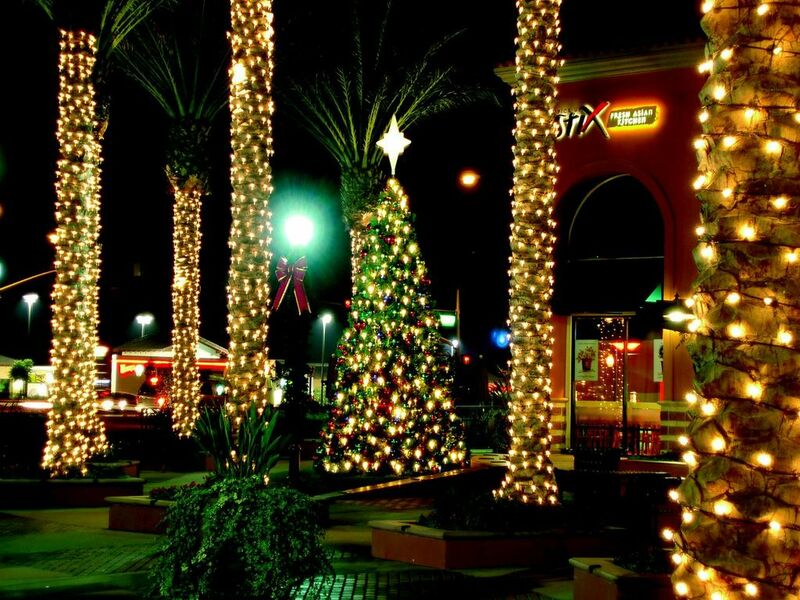 Outdoor Lighting Perspectives of San Antonio offers a super convenient way to get a professionally designed and installed outdoor holiday lighting display, while you concentrate on the other aspects of this wonderful season. We can design, install, remove and store your magical display and let you concentrate on the reason for the season. First we consult with you to get your input as to what style of Christmas lighting tickles your fancy. Whether your taste leans more towards old world elegance and traditional designs, or designs that are unique and full of playful whimsy, we can accommodate any style with our huge selection of holiday lighting elements. After the consultation we go to work on designing your holiday lighting display by ordering the lights needed to fill your winter wonderland. All of our lights are ordered new, not like other holiday lighting programs that recycle used lights from customer to customer, year to year. Once these lights are ordered especially for you, we then install your holiday lighting in plenty of time to enjoy many nights of awe-inspiring beauty throughout the holiday season. We can even program your lights to go on and off at specific pre-set times for you so you don’t have to lift a finger. After the holidays are over Outdoor Lighting Perspectives of San Antonio will take down your holiday lights and store them in our temperature controlled warehouses until next year, when we do it all over again for you. Offering you the convenience of storage away from home will give you the gift of more storage space for other items and give you the freedom to add to your holiday lighting design as the years progress. Our holiday lighting program is the ultimate in holiday luxury, and makes the perfect gift for yourself because it is the gift that keeps on giving for years to come! Much of our holiday lighting is available in the energy-efficient LED lights as well. LED lights are eco-friendly with less impact on our environment and are long-lasting, and promote a clearer, even and more vivid illumination than the holiday lights of Christmases past. 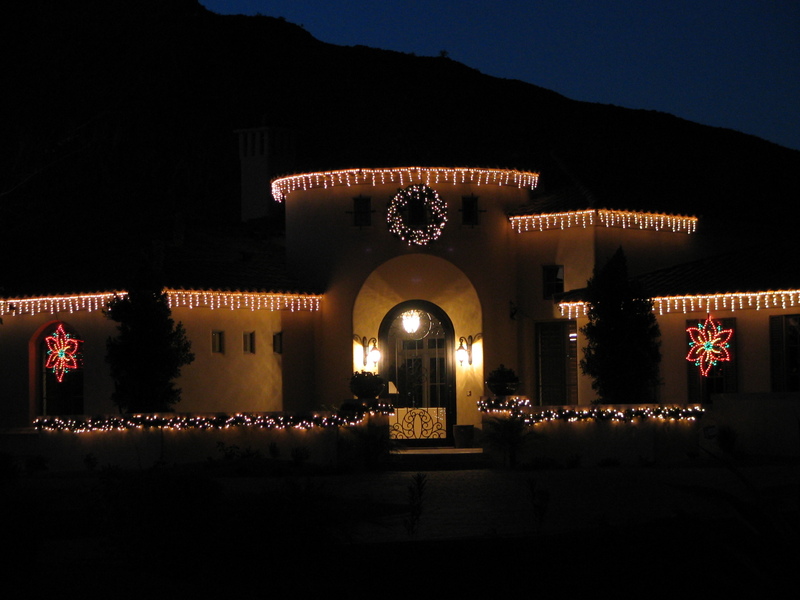 We offer LED roofline lighting, LED string lights, Classic LED lighted wreaths and garlands and much more. Contact us today because our holiday lighting program is on a first come, first serve basis and spots are filling up quickly. 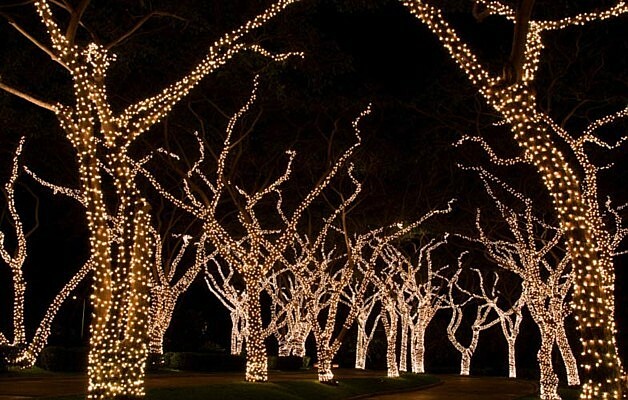 Dont delay contact us today to create a stunning outdoor holiday lighting design for your home and landscape this season. To see more images of ethereal holiday lighting by Outdoor Lighting Perspectives of San Antonio visit our holiday lighting photo gallery located on our website.